Travel is the third largest expense for most organisations. With this in mind it’s vital that businesses get the most value for money in this all-important area. In the TMC (Travel Management Company) sector EQ Travel is unique in that we work on a transaction fee basis - no mark ups, no hidden fees just the price or your ticket and a standard transaction fee. With business travel spending expected to increase by 6% in 2015, the transparency we offer in our open book policy means our clients can potentially make huge savings. We work with a variety of clients on a variety of levels; large corporate organisations that we manage international trips for, other regional clients that book their train travel and hotels through us. For many SMEs business, travel is often booked independently by individuals within the business however are they getting the best deals? Does the time spent looking at all the different service providers, airlines and a variety of routes mean there is any actual savings? Does your business have a Corporate Travel Policy for all your staff to adhere to and if so, how is it policed? And most importantly, as a business owner are you and your employees adhering to duty of care guidelines and the European Corporate Manslaughter/Homicide Legislation? A common misconception is that by booking your own travel, you’re saving money. This is often not the case. The advantage of dealing with a TMC is that travel is their profession; individuals booking their own trip are generally trying to get to a meeting / event / conference etc. and are limited to the options returned by the website they are viewing. Take a straightforward US trip, Edinburgh – Los Angeles. Most people would think via London or New York and this is indeed correct. However to obtain the best fares, you should be researching via Amsterdam, Paris Frankfurt, Dublin, Toronto and Chicago then look at alternate airports, Glasgow via Rekjavik, Philadelphia, Toronto, Halifax and the options go on. This is all very time consuming and takes you away from your actual job. On a domestic trip think about a meeting on Old Broad Street in the City of London - Our brains say, London City Airport and the tube to bank, two left turns out of exit two and you’re there, which again is correct. But consider Stansted with a 28 minute rail connection to Liverpool Street or Gatwick with the Gatwick Express and a tube to Liverpool Street, then cross the street and you’re at the other end of Old Broad Street. In this case the London airport we generally think of first, Heathrow, is the one with the longest transfer times. Then you have to think about taking the train, the 5:40am departure from Waverly has you in Kings Cross at 9:40am and who couldn’t benefit from four uninterrupted hours with your lap top or indeed a four hour snooze. 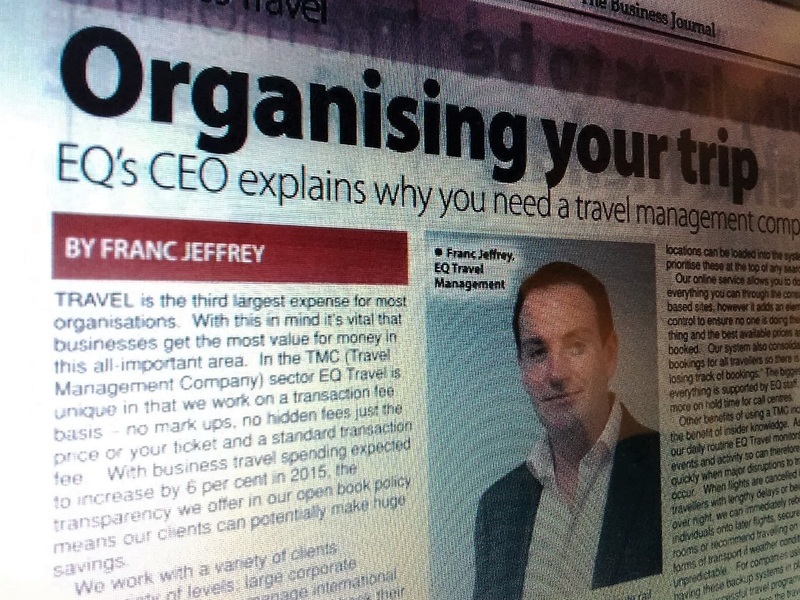 Many SME’s wrongly assume that TMC’s only deal with larger corporate businesses however EQ Travel Management also offer solutions aimed specifically at SME’s, making sure their travel management is affordable whilst also fulfilling their legal obligations to their travellers. EQ offer a variety of services tailored to the client and their business needs. For smaller firms, users can book rail travel, flights, car hire and hotels via our online booking tool with a standard low cost transaction fee per booking. This service is perfect for business travellers who know where they want to go and when; travel bookers can use the on-line search facility to return results for flight details which covers all airlines, including the low cost ones. Similarly if you know what hotel you want to stay in, our system can check the best rates for the time of your stay. Your preferences, corporate rates (if applicable) and company locations can be loaded into the system to prioritise these at the top of any search. Our online service allows you to do everything you can through the consumer based sites, however it adds an element of control to ensure no one is doing their own thing and the best available prices are being booked. Our system also consolidates bookings for all travellers so there is no more losing track of bookings.” The biggest plus, everything is supported by EQ staff, so no more on hold time for call centres. Other benefits of using a TMC include the benefit of insider knowledge. As part of our daily routine EQ Travel monitors global events and activity so can therefore respond quickly when major disruptions to travel occur. When flights are cancelled leaving travellers with lengthy delays or being stuck over night, we can immediately rebook individuals onto later flights, secure hotel rooms or recommend travelling on other forms of transport if weather conditions are unpredictable. For companies using a TMC, having these backup systems in place are key to a successful travel programme. Often solutions are found before the travel issue becomes public knowledge, therefore before the rush or longue airport queues begin. So, whatever the size of your business, if you or your workforce travel, you may want to consider enlisting the help of a TMC, just make sure you take note of the following points! 1. Lumps on your plastic. If your TMC asks for a company credit card and lumps charges together “to make things easier for the billing,” ask for a breakdown. You don’t want to see one big charge at the end on your credit card. You need to see each line item spelled out so you know you are getting what you paid for. 2. Ask for an audit. Don’t be afraid to ask for an audit breakdown of all costs. In fact, insist on it. If your TMC refuses, ask why. The overall “hidden fee” problem leaves corporate travel departments with incomplete data to prove they have met airline contractual obligations and to effectively negotiate new agreements; this can lead to higher fares being paid by the company. 3. They work for you. Do you feel like you are being forced to alter your company travel policy to work with a TMC? Remember, you are in the driver’s seat, they should be adapting to your plans. According to one travel expert, “TMCs are notorious for signing and plugging your into a one size fits all programme. They sell you on personalisation then set you up to be the same as everyone else. Stick to your guns. If they don’t have the personalisation you need, then they may not be the TMC for you.” You decide on your company’s travel structure and stick to it. 4. Personal service. Demand a high level of personal service before signing any contract. Will your concerns be routed to a call centre in India or to someone at the main office? Will your hold times be measured in minutes, hours, or by a calendar? (“Thank you for holding. Your call is very important to us… although not important enough for us to actually answer you.”) or will you wear your finger down to the bone hitting annoying option after option to keep you in a loop.